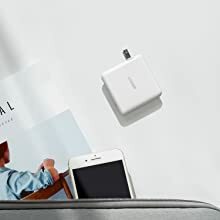 Amazon's Choice for "usb-c charger"
[Wide Compatibility]: Charge Apple, standard USB, and USB-C phones and tablets all from one travel-ready wall charger (max. 19.5W output via USB and 30W via USB-C). 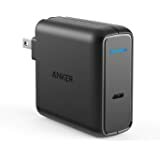 [High-Speed Charging]: Get the fastest possible charge with Anker's signature PowerIQ 2.0 for phones and tablets, and Power Delivery (up to 30W output) for USB C devices. 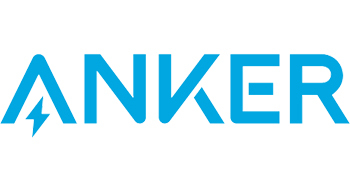 [Superior Safety]: Anker's MultiProtect 11-point safety suite provides complete protection for you and your devices. [Premium and Portable]: A compact build designed to go absolutely anywhere. 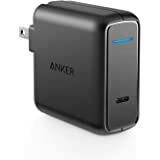 [What You Get]: PowerPort II with Power Delivery and Power IQ 2.0, welcome guide, our fan-favorite 18-month warranty, and friendly customer service. 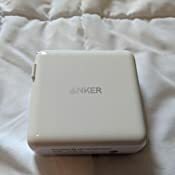 Our acclaimed series of powerful, portable wall chargers. Built using only high-grade materials and exclusive charging technology. Compact size meets massive power. 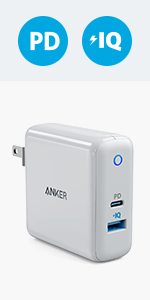 Equipped with Power Delivery and PowerIQ 2.0 to charge any two devices at top speed, simultaneously. High-speed charging for USB-C—providing enough power to charge even laptops and game systems up to 30W. 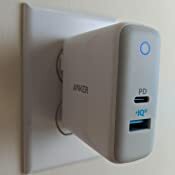 PowerIQ 2.0 technology intelligently detects your devices and adjusts output, providing the fastest possible charge to almost any device. Simply slide down to charge, then snap back into place when it’s time to go. Fits effortlessly in any pouch, purse, or pocket. Samsung Galaxy S10 / S10e / S10+ / S9 / S9+ / S8 / S8+ / S7 / LG / HTC / Nexus, Pixel 3 / 2 / XL, and more. After connecting to iPhone (8/8 Plus/X/XS Max/XS/XR), fast charging (9V) will begin automatically, regardless of whether you hear one charging indicator sound or two. Not compatible with the Microsoft Surface series. 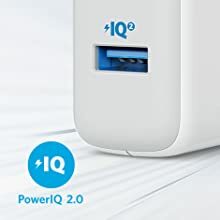 2.0 out of 5 starsPower IQ 2.0 extremely disappointing. 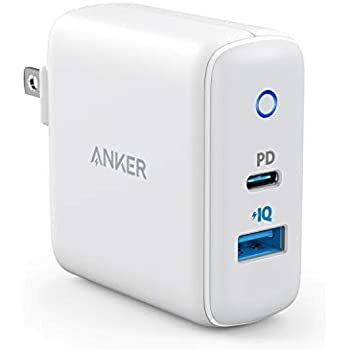 A major factor for me buying this charger was for the Power IQ 2.0, which was touted as being able to fully charge devices at their maximum speed. On the bottom of the charger it shows the unit able to deliver 5v at 3 amps (15 watts), 9v at 2 amps (18 watts), and 12v at 1.5 amps (18 watts). Using my Samsung Galaxy S7 and a USB volt/ampere meter, the fastest I saw the unit get up to was 8.79v and 0.95 amps. Now of course the phone reported that it was 'fast charging', most likely because it saw the charger was able to output the increased voltage, but the 8.5 watts it puts out is a far cry from the nearly 15 watts the stock Samsung fast charger provides. Not impressed. 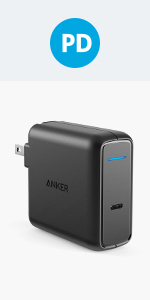 May revise to 3/5 stars depending on how the USB C Power Delivery test goes, but so far, not impressed Anker. Update: Forgot to mention I was using high quality Anker cables, capable of carrying the required current. I should also add that the phone was at around 10% charge, so it should have (and was accepting with the Samsung Charger) the full charge current. 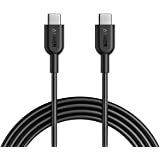 I have been buying a few different USB-C chargers as well as the standard USB-A. This charger is no faster than my standard Apple charger that came with my iphone XS Max. 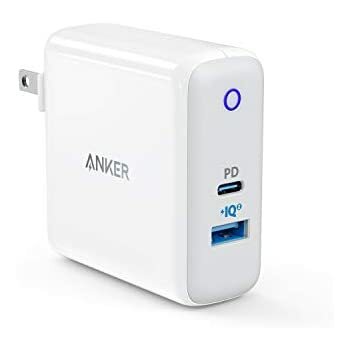 I found another charger that Anker makes that is higher wattage, the 49.5 watt in white is faster than a standard Apple charger but not but a drastic amount. It charged my iphone from 53% to 100% 9 minutes faster, this is not considerable either. 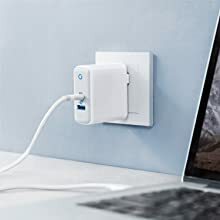 I found that the Apple brand USB-C chargers are faster than all others I have tested. 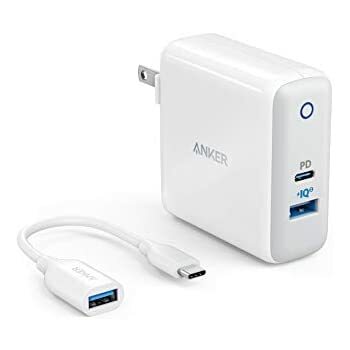 I primarily purchased this as a travel charger so that I can charge my phone and Switch at the same time, BUT have my phone charge quicker than my regular (non USB-C/Power Delivery) chargers. 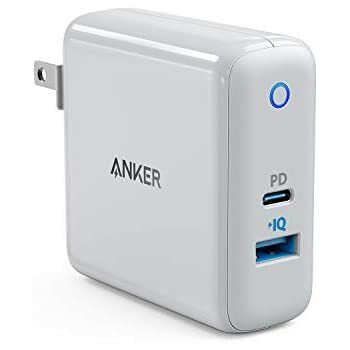 After using it for about a week, I believe this will be my new go-to charger for the foreseeable future (replacing my 4 port Anker wall charger). 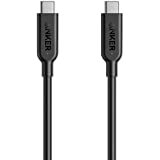 For me, the main selling point is having both a USB Type A and Type C connectors so that I don’t have to worry so much about which cables I bring with me on the go. Charging my Pixel 2 XL over USB-C w/ PD from 15% to 100% took 2 hours 40 minutes, which is pretty good. While charging, the Pixel 2 XL shows “charging rapidly”, just to confirm that the Power Delivery feature works as expected. 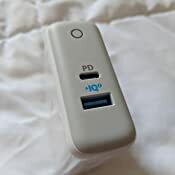 When charging my Pixel via USB-A w/ IQ2 it only shows “charging”, so it would take a while longer. I have not tested how long it takes to charge my Switch, but it does seem to charge faster than my previous charger. Overall, I am happy to have a multiple port charger that includes a USB-C port AND USB-A port simply for versatility sake. Two things I would like to see in a future version… Black version. Add additional ports. I got this charger and Apple USB-C to lightning cable. I have an iPhone X, an iPhone 8 Plus, and an iPad Pro 2017. I tested the PD charging on all three devices when their battery level are around only 20%. On iPhone X and iPhone 8 Plus, it charges at only 12 watt which is equivalent to using an regular iPad adapter to charge the iPhone. Advertised iPhone charging watt should be 18w. On my iPad Pro, it works fine and charges at 30 watt. 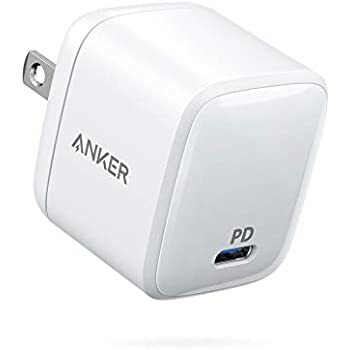 If you use this to charge only an iPad Pro, you can go with it. 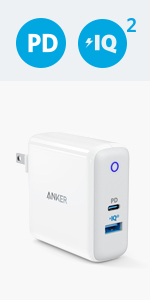 For iPhone users, this item is no different comparing to a regular cheap 12w iPad adapter. By the way, the other port only gives you 5w. Very misleading advertisement. 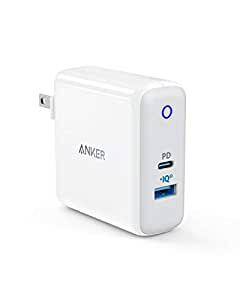 I think I will send this item back and look for another charger that can charge iPhone and iPad Pro both at their optimal wattage. 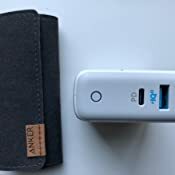 5.0 out of 5 starsAnother great item from Anker! 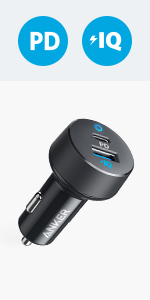 This Anker charger delivers! 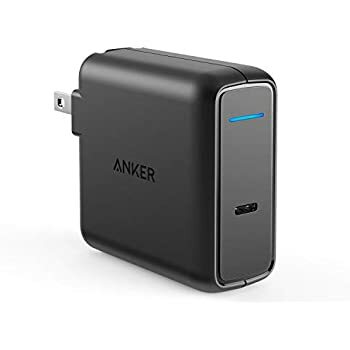 I was looking for a 'fast charger' for my iPhone 8+ with another USB port for misc items (bluetooth headset, aux battery and bluetooth speaker). 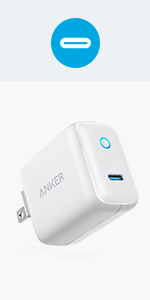 Size - very similar size to other "brick" chargers from Anker. Speed - I used an Apple 1M USB-C to Lightning cable to charge. It charged from 0-48% in 30 minutes and 0-74% in 60 minutes. Overall, very fast. I have not charged USB-C and USB at the same time yet. Light - I like having the blue light on the front to show it is plugged in. It acts as an indicator that it didn't fall out of the socket or the hotel plug is turned off. 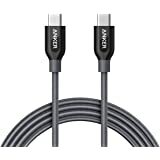 I've never been disappointed in an Anker product...but I am still waiting for their USB-C to Lightning cord! 5.0 out of 5 starsUpdated:Original Review below. CS gave me a replacement charger w/o having to send the old one back the new one is outputting 5V even when drawing 2.4A(at least). I wish it'd be outputting 5.25V like the OEM charger but 5V is still within the normal range that I expected. Thanks to the CS reps I've moved it to a 4/5 if I could do half stars I would and it'd be a 4.5/5 because it was not high enough voltage to me(it should be max from the USB spec which is 5.25V). So I have rounded up the review score. Provides less power than listed in the specs. The Poweriq port is supposed to output atleast 5V but with my multimeter it outputs no more than 4.9V and drops down to 4.74V. 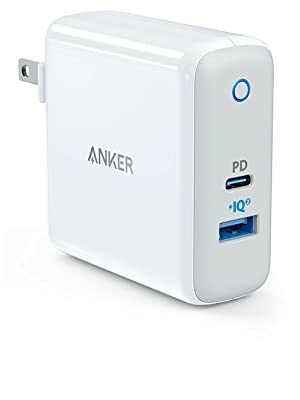 Every _other_ usb outlet I've ever used has always outputted 5V when nothing was being charged, and they never dropped below 5V. 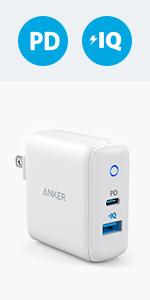 So in summary if you're looking for a usb charger for your phone or other device, look elsewhere. The thing won't even output the voltages listed on the side so I can only imagine how "smart" the poweriq is. This charger charges Dell Latitude 7280 and Asus Chromebook c101pa. Latitude 7280 complains that the charger is not powerful enough, but it lets me use the laptop while charging the laptop anyway. The prongs do fold. 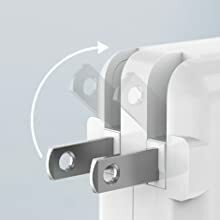 Another reviewer mentioned this, but why doesn't Anker mention this or include a photo with folded prongs when it is an important travel feature? I would have liked the charger to be smaller and lighter.